Perhaps you’ve heard that there’s a threat looming on the horizon. A pair of dark clouds hanging over our favorite websites. The dark clouds are called SOPA and PIPA. If you haven’t heard about them, allow me to bring you up to speed. You see, content providers are scared that their content is being copied online. There are laws in place to deal with this, but they want more laws. Tougher laws. Under SOPA and PIPA, not only would copying copyrighted content be a crime, but linking to it would be a crime too. It doesn’t even have to be you posting a link. If you own a blog and a commenter leaves a link to a site that contains a copyrighted image, your blog can be shut down. Not only that, but any ad network or Paypal accounts can be shut down too. To imagine the effect of this, picture every blog having to police every link that they and their commenters post lest one lead to a site with a single infringing image. Now, picture Twitter or Facebook having to do this. Imagine Google needing to not only filter out Google+ but their normal search results as well. After all, one of the links they index might have an image that someone else claims was wrongly posted. Google and dozens of other Internet companies will need to make these decisions on the fly. If they make one wrong move, you could say goodbye to services such as Twitter, Facebook, Pinterest, and YouTube. Speaking of which, YouTube is always a source of entertainment: Animals acting cute, people acting out strange stunts, and kids singing pop songs. Well, strike that last one. If you post a video of your kid singing a copyrighted song, you could end up behind bars for 5 years. You read that right. Five years of jail-time for a YouTube posting. Now, you may have heard that SOPA was killed. When people heard the news, they began to celebrate. This celebration was, sadly, premature. 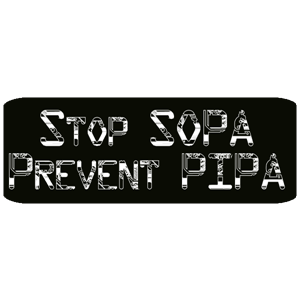 SOPA hasn’t been killed or even shelved. Instead, House Judiciary Committee Chairman Lamar Smith plans on continuing work on SOPA next month. The claim is that this break is due to “Republican and Democratic retreats taking place over the next two weeks.” Personally, though, I think this was a delay tactic to try to get the outcry to die down. Even if it is killed, though, we will need to remain vigilant. Legislators love taking controversial bills, breaking them apart into different pieces, and sneaking them in attached to other pieces of legislation (the more “must pass”, the better). Lest you think that all of this will, at least, somehow stop piracy, it won’t. The site takedown only keeps the domain name from pointing to the site. If you know the IP Address, you can still get to the site. This will hurt you and me as normal users won’t remember your site’s IP address. Pirates, however, will still be able to connect to their destinations just fine. Maybe you are wondering how the tech companies allowed these bills to get this far. Simple: They were not only not consulted, but actively excluded from the discussions. Only pro-SOPA companies were allowed in. Meanwhile, during hearings, Congressfolk seemed to reveal in their ignorance of how the Internet worked. They said that they aren’t “nerds” and that discussions of Internet security were a “waste of time.” They ignored experts saying that this would break the Internet. Apparently, not knowing how something works isn’t a barrier to passing a giant legislation package regulating it into oblivion. Is it any wonder that the bill wound up so one-sided?